The Web becomes more dangerous every day. Malware has become ubiquitous, scam sites proliferate, and there are constant privacy dangers. Children can easily stumble on sites that aren't suitable for them. What to do? Try WOT (Web of Trust), an excellent--and free--browser add-on that offers protection. 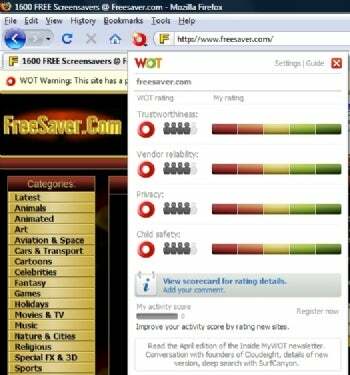 WOT rates every site for trustworthiness, vendor reliability, privacy, and child safety, and shows you the results using simple-to-scan colored icons. (Red for bad, green for good.) When you do a search in Google or another Web site, you'll see the icons and know what you're in for if you visit. You can also visit the WOT rating for each site to see why it was given its rating, and read reviews by people who have visited the site. It offers other protections as well. When you visit a site with a red rating, you first get a big warning on your screen. That way, you can either navigate away or click through at your own peril. And when you're on any Web site, click the WOT button in Firefox and you'll be shown details about the site's rating as well. You can view information and ratings about Trustworthiness, Vendor Reliability, Privacy, and Child Safety. The newest version of WOT has four levels of safety from which you can choose, including Lite, which shows ratings icons only for dangerous sites, all the way up to Parental Control, which in addition to blocking dangerous sites, also blocks sites not suitable for children. In addition, WOT is now available for Internet Explorer 8 (although not earlier versions of Internet Explorer), as well as for Firefox as an add-in.